Kevin Beaumont, one of the security researchers studying this ransomware, managed to intercept some of the domains Locky uses for its Command & Control (C&C) channel. This allowed him to estimate infection rates, and he found Locky seems to infect over 100,000 victims per day. Infection rates varied by country, lead by Germany with around 5000 new infections per hour at its peak. Last Thursday, I personally received a variant of Locky in an attachment called “Rechnung-263-0779.xls” (which is German for “invoice”) in a Spam inbox. I decided to use this file to analyze all the ways WatchGuard’s unified threat management (UTM) appliances could stop this brand new ransomware. 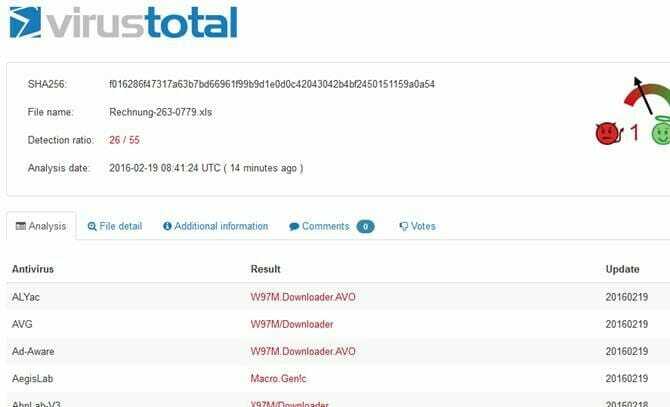 To start, I uploaded the infected file to www.virustotal.com to see which antivirus (AV) vendors had a signature available. As the email was already in my inbox for over 24 hours, 26 out of 55 AV scanners were able to detect it. AVG—the AV engine WatchGuard uses for Gateway AntiVirus (GAV)—was on that list. So right away, WatchGuard’s GAV service can block this particular variant from reaching our customers. Nowadays, malware changes and evolves quickly, which is why signature-based AV often can’t keep up with the latest threats. To combat this problem, WatchGuard offers another layer of protection to detect brand new, never before seen malware files. We call this solution APT Blocker. I also ran this ransomware variant through our next-gen sandbox, to see whether or not APT Blocker detected the file’s bad behavior. It did! The malicious “invoice” file received a score of 99/100 which represents a high risk. It’s particularly important to understand the added benefit of the APT blocker solution. Even if the file used to deliver Locky changes, its behaviors won’t. That’s why this solution can catch new things signatures might miss. Another question came to my mind: What happens if the ransomware is already in place, or reaches the system from another source (e.g. USB drive)? As I mentioned earlier, Kevin Beaumont managed to identify some of the domains Locky uses for its for C&C connections. WebBlocker, the URL categorization service in WatchGuard Fireware, treats them as subcategories of “Security” or “Extended Protection”. If you block these categories with WebBlocker, it prevents Locky from calling home, and also helps you identify systems that have gotten infected. To verify this, I entered one of Locky’s known C&C domains into our online tool to confirm that we indeed list it as a known bot network channel. Once I verified that many of our UTM’s security services could detect Locky, I ran through one last test… I personally tried to download the malicious file “Rechnung-263-0779.xls” from my webmail. I’ve configured my WatchGuard Firebox with HTTPS Deep Inspection. This feature allows WatchGuard’s security services, such as GAV and Intrusion Prevention Service (IPS), to run security scans even on encrypted web traffic, like the webmail I was using to download this ransomware. Despite the encrypted webmail connection, our Firebox detected and blocked the Locky invoice file with the GAV service. It was unable to reach my workstation. Excellent write-up. 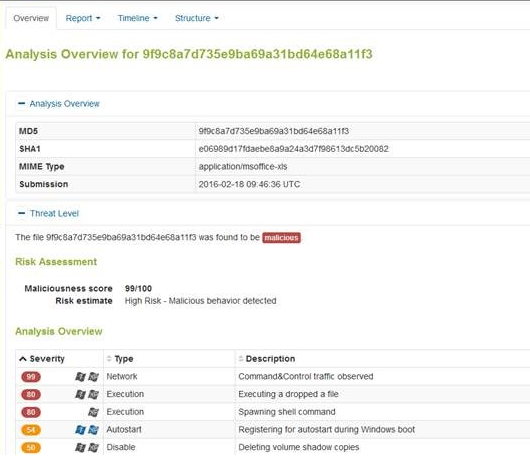 Nice to see details behind the behaviors of a new Ransomware variant. Good to know it has been identified. Jonas, I have a firewall noob question. If this malicious email made it into your spam folder and you had opened it from outlook or another non-webmail application, isn’t the file effectively on your system? When you try to open it up at that point, do any of the above mentioned services actually do anything to prevent you from getting infected if you have macros enabled? I’ll try to response in lieu of Jonas. This really depends on the settings of your firewall. If you are using a WatchGuard Firebox, with all the UTM services, there is a good chance our GAV or APT Blocker services would strip the Word or Excel attachment even before the message gets “spammed”. So even if we saved the message in quarantine if we recognized it as spam, our proxies and security services may have already stripped the malicious attachment, in which case you could not recover it in quarantine. That said, if the attachment itself does make it with the message, then yes, if your user opened the attachment from quarantine they could get infected. In that case, though, our Firebox may actually recognize the command and control call home with Web Blocker (as Jonas mentioned) so at the very least, our reports could help you identify the infected computer in your network. hello is there anyway to decrypt the files affected by locky? not using shadow copies nor system restauration, but some decryptor software? Hello. My small office was infected yesterday with locky. We have run Malwarebytes, spybot, and they have found and eliminated many threats. However none of them were named anything similar to locky. Is there anyway to identify which computer on the small network (6 pcs’) is the infected station? I have followed the instruction I read to look at the owner of the “help” file, but each pc names that pc as the owner of the file. If I can identify the infected pc I can just remove it from the network. Thanks very much for any help with this. Reblogged this on Bantu Tech.